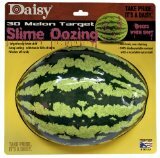 Daisy Hunting Oozing 3D Waterm..
Daisy Oozing Melon Watermelon ..
Three-dimensional watermelon target Reusable, long lasting Pink soy-based oozing slime is non-toxic, non-staining 100% biodegradable content and recyclable outer shell Made in the USA Ever used a watermelon as a target? Now Daisy takes a fun backyard activity to the next level with our new Oozing 3-D Watermelon Target. The three-dimensional watermelon target is fixed to a card which, when used with a safe backstop, provides hours of shooting fun. Save the watermelon for the picnic. These targets are reusable, long-lasting and can withstand a surprising number of BB shots. Every shot produces a flow of pink soy-based oozing slime which is non-toxic, non-staining and washes off easily. Made in USA with 100% biodegradable content and recyclable outer shell.